We missed it on the first go, but found it after the U-turn! Where to begin?! We had already gotten on I-4 to leave Orlando when I decided to give my HappyCow phone app a quick check. I was super hungry and wanted breakfast, and it was just after 11am. That’s when I found Raphsodic Bakery, and according to the website, they had biscuits! Turns out it was pretty close to where we had just left from, near downtown Orlando. I was going to hold out until we got further south for Darbster lunch, but then Thomas reminded me that they’re closed on Mondays! So we turned the car around and headed to the bakery, and I’m so glad we did! Unfortunately there were no fresh biscuits available for purchase that day. The boy at the counter explained that they had some from the day before in the back that were going to make it to one of their “Yesterday’s Box”s. I asked for the least sweet item, and picked up a blueberry scone. We also selected a biscotti and a piece of apple pie to share. This landed us in the ball park of $11. I noticed that there was an extremely generous box of day old goodies marked for only $12 or $13, but I wanted to try the fresh stuff so I could give you an accurate review. 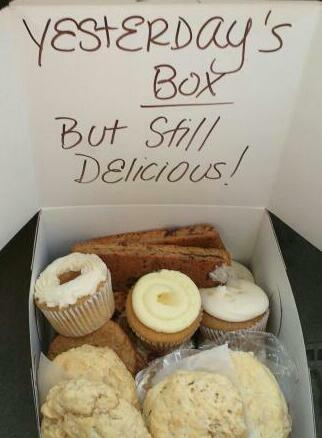 (PS – If their day old baked goods don’t sell in the store, they donate whatever’s left!) So off to the table we went with our mismatched plates to get into some yummies. We both agreed the almond biscotti was pretty awesome. The scone was subtly sweet as promised and perfectly delicious. I had to try hard not to eat the whole thing! The apple pie was a little different than the usual texture when it came to the filling. Instead of big, jelled pieces of apple it was a finer texture of well spiced, tiny pieces of apple that weren’t overcooked, so it gave it a surprisingly welcome fresh taste. Having sampled the goods and spotted a section of teas in the back, I asked Thomas what he thought about taking home one of those “Yesterday’s Box”es. He assured me that he could eat his way through it. I headed back to the counter, smiling, but the dude behind it didn’t seem surprised. I asked him if they had herbal teas, and he showed me their vast assortment of both caffeinated and not. I picked out a really nice herbal chai blend that he had bagged himself. It smelled so good that I left the tea cup in the car for days. On purpose. ; ) I also got him to throw some of their day old biscuits in with the box! YAY! And of course I sampled them on the way home. Though he was right, they were better slightly reheated at home because of their age, but still really tasty. They were cheesy herb biscuits, and I could have eaten a whole box of just that. Our box was so heavy and full! There were tons of cupcakes in there, sugar cookies, biscotti and sugar cookie “sammies”. Unfortunately we didn’t get to eat all of it while it was still really fresh due to the Thanksgiving holiday, but I can tell you that it was all really good. In fact, out of that whole huge box, the only thing we weren’t crazy about were the “sammies”. It was just way too sweet on sweet. I took two to work that Tuesday, and Thomas ate one at home, and we all agreed even though our taste tests were independent. The icing was just way too sugary with that cookie. The cookies by themselves were almost caramelly and complex. Really everything else was fantastic. The lemon frosted candied ginger cupcake that I had later that day?! Um, pretty much blew my mind. The fruit topped one was good, others in there were carrot cake, vanilla (? ), peanut butter & jelly (? ), and a whole bunch of these spicy, chocolate on chocolate numbers. Yah, spicy! I thought the heat was great. I’m not a big sweets person. You could’ve just handed me a box full of the biscuits and I would’ve been the happiest person in the world, but I will definitely be paying them a visit anytime I’m in O-town! 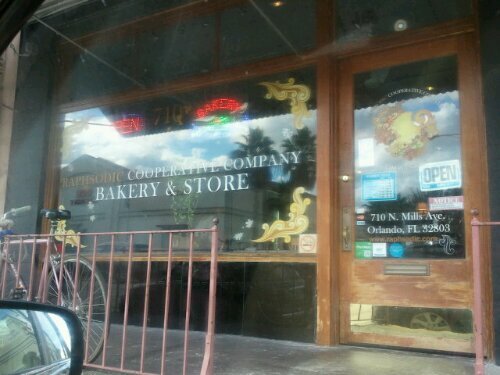 Raphsodic Bakery is located at 710 N Mills Ave, near downtown Orlando, Fl 32803. Open M/T 11A-8P, W/Th 11A-9P, and F/Sa 11A-10P, Call 407-704-8615. They do special occasion cakes too!